Are dandelions, crabgrass or other weeds invading your lawn? Removing these nuisances can be a challenge because many weeds spread aggressively and can be hard to dig out. If the weed is left to produce seed, animals, people and wind can spread the seeds all over your lawn. Fortunately, weeds are just like any other plants. They need water, sunlight and nutrients. The best way to battle weeds is to remove their resources while encouraging the grass. A good, thick lawn will choke out weeds and keep your landscape attractive. Thick, healthy grass prevents weeds. Apply fertilizer to your lawn, preferably in the fall, so the grass can get a healthy start before the weeds emerge. Mow regularly so the weeds do not go to seed. Bag and dispose of lawn clippings so the weed seeds do not spread around the yard. Dig weed roots up with a small shovel or weeding tool. Apply an herbicide. Some commercial herbicides are formulated to kill only the weeds and leave only the grass. If you don't wish to use chemicals, use boiling water or vinegar to spot-kill weeds. Aerate the lawn, using an aerator. This will help loosen the soil and allow the grass to take root and become stronger. 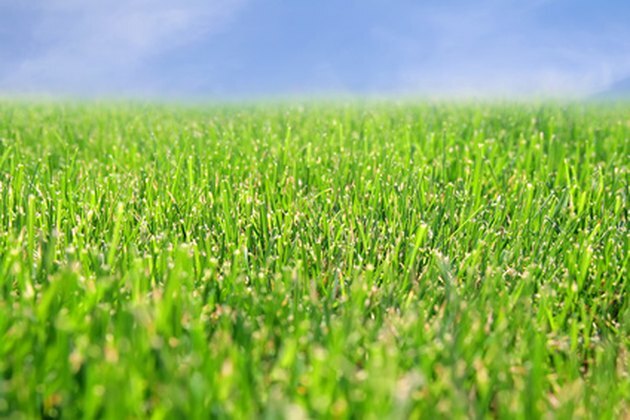 Reseed bare patches in the lawn with the type of grass that grows best in your climate. Catherine A. Mezensky has been writing professionally since 2002. She writes about gardening for various web sites, including eHow. Mezensky holds a Master of Arts in liberal studies from Loyola Collage in Maryland. She also has a professional background in museum education and English writing.